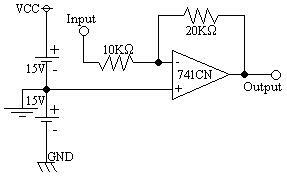 The objective of this lab is to construct several amplifier circuits using operational amplifiers, then to test the operation of those amplifiers and compare the results with theoretical values obtained through calculation. 2) Set the input voltage to 2VAC. 3) Measure the voltage produced at the output. 4) Calculate the theoretical voltage at the output and compare the two results. From this lab it is concluded that an Operational Amplifier can be used to create a working amplifier that exhibits a predicable pattern. In addition to the tests that I performed in accordance with the lab, I also tested the amplifier with other functions (square wave, triangle wave, sawtooth wave), and it performed as exceptionally. 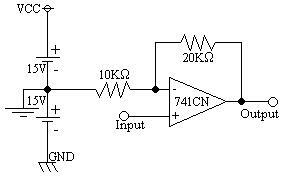 I am pleased to find that the operational amplifier follows the mathematical equations very well. Although I am not sure of the error in the cascaded amplifier, there may have just been an errant observation.